Title insurance protects buyers and lenders from property loss or damage they could experience from liens or defects in the property’s title. Unlike other insurance options that require monthly premiums, title insurance is a one-time fee paid by the buyer at the time of closing. Two policies in order to be insured against various possible title defects on a property. Prior to closing, the insurance company will run a title search on a property. This typically takes between two and three business days and statistics show that more than 33 percent of title searches result in a problem that must be resolved before closing. Liens or defects on the title can include tax liens, abstracts of judgment, child support liens or bankruptcies. A lien means another company or person has the right to keep possession of your property until your debt is repaid. Without title insurance, the new buyer would be responsible for clearing any defects that are on the property. A home appraisal is a report on the fair market value, performed by a trained and licensed individual. It should be scheduled as soon as all inspection items are addressed and corrected. Appraisals are needed to ensure the homebuyer, the home seller and the mortgage lender receive the accurate and true value of the property. In most residential property transactions you are able to choose your realtor and your lender, but you cannot choose your appraiser. 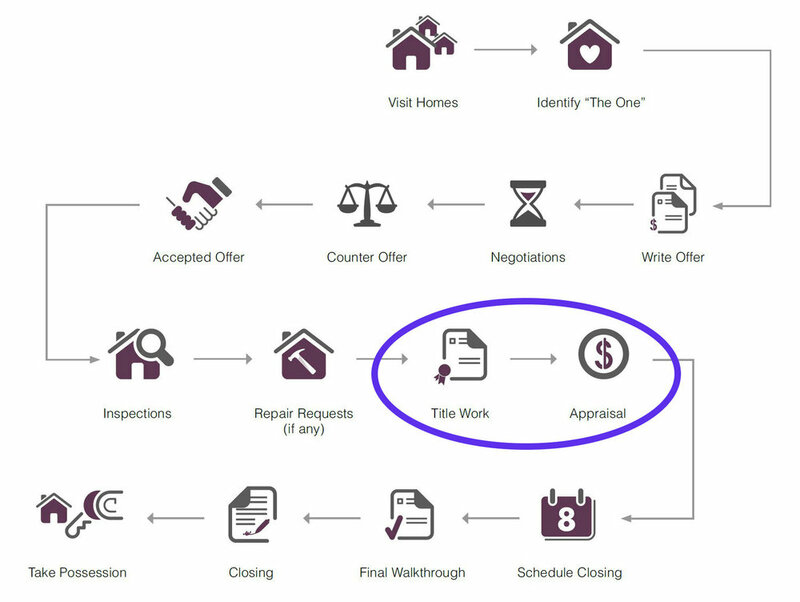 Instead the appraiser must be chosen by your lender to provide a level of independence from the buyer and seller. While your lender will typically arrange for an appraisal, the buyer is ultimately responsible for the cost. Generally appraisal fees range between $450 and $750, depending on the size and location of your property. Don’t let this cost stop you from making offers: The home appraisal will only occur after your offer has been accepted by the seller and you have begun to work with a lender to finance your new home. You do not need to complete appraisals on every house you choose to bid on. The appraiser determines the value of a home based on comparable sales in the same neighborhood. The appraiser will look for similar homes that sold within a six-month period. If the comp is bigger or smaller than the subject property, the appraiser will calculate an adjustment. Similarly, the appraiser will make an adjustment if there are any additional features such as a deck, a view or a yard, which add value to one property but not the other.